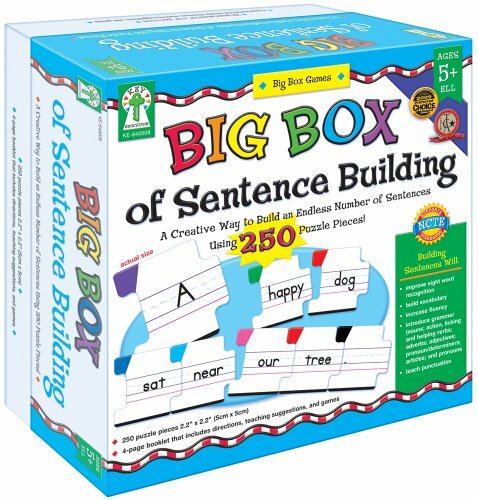 Improve sight word recognition, vocabulary, increase fluency, teach punctuation, and introduce grammar with the Big Box of Sentence Building! The 250 puzzle pieces (approx. 2" x 2") also include four blank puzzle pieces that can be used with write-on/wipe-off crayons or dry erase markers. The pieces are also color-coded by the part of speech it represents. The game includes a 4-page booklet with directions, teaching suggestions, and games. The games include Scrambled Sentences, Spinner Game, and much more. It also supports NCTE standards. Key Education products are intended to engage and educate young and special learners, as well as assist teachers in building a strong and developmentally appropriate curriculum for these children. The product line—comprised of teacher/parent resource books, photographic learning cards, and other activity- and game-oriented materials—is designed to assist in Unlocking the Potential in Every Child. If you have any questions about this product by Key Education Publishing, contact us by completing and submitting the form below. If you are looking for a specif part number, please include it with your message.